The scroll-bars that appear on the right-side and bottom of gnome windows lack sufficient contrast to the scroll-track. I have difficulty identifying where in the scroll-track the bar is positioned. I often mistake the background of the scroll-track as the scroll-bar itself. I'm using Inverted Control theme. More contrast and better color separation is needed here. I often mistake the scroll-track as the scroll-bar because there is not enough contrast between the two and the rest of the window. This bug is a very serious accessibility issue. I'm barely to make out the scrollbar/trough contrast. I agree, this is a serious problem. Even in Precise alpha 2, the scrollbar is gray on gray background. I tested it with Firefox. I recommend the papercuts project to take a look at this. Ivan writes in duplicate of this bug number 563474: "In my opinion it's good solution just to set "colorize_scrollbar" to TRUE in theme gtk-2.0/gtkrc file." I agree with him. I've forwarded this to Ayatana Design and marked as Opinion until they give feedback. Bugs are marked Incomplete while waiting for design input. I use the Ambiance theme. I fixed my Chrome scrollbar thumb and trough contrast problem by editing /usr/share/themes/Ambiance/gtk-2.0/apps/chromium.rc. The issue is the same in Ubuntu 13.04. Any news on Ayatana Design feedback? Is there a link to a relevant thread in their mailing list? I would like to see this fixed also as the standard contrast becomes invisible when the sun is shining. 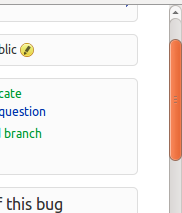 Since Ubuntu switched to using upstream GTK+ overlay scrollbars, the non-overlay ones are orange as well. Oh, reopening since the fix for GTK+ 2-based applications still has not landed.